CANNES, FRANCE--(Marketwire - January 21, 2011) - IODA, the global leader in digital distribution, marketing, and technology solutions for the independent music industry, today announces the launch of the completely redesigned Rightsholder Dashboard™, the main interface between IODA clients and their global, digital business. With new, multi-layer functionality, the Dashboard synthesizes the broad range of data required to effectively manage global sales and marketing activities. The announcement was made today at the annual MIDEM conference in Cannes, France. "IODA's Rightsholder Dashboard 2.0 sets a new standard for digital distribution and the flexibility and functionality it requires. Now, we can fine tune how and where our content is sold and promoted in the global marketplace," commented Kieran Roy, General Manager, Arts & Crafts. "IODA's surgical approach to content ingestion, workflow, pricing and delivery, publishing, mechanical clearances and artwork gives content owners direct control." 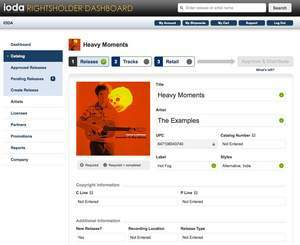 "IODA's new Rightsholder Dashboard sets a new benchmark for digital content management platforms," commented Mike Drake, VP of Engineering at IODA. "It gives our users the power to customize how each release is sold and promoted globally through fine-grained delivery and pricing options. It also provides a suite of powerful sales analytics and reporting tools, so our clients have direct access to insight-generating sales and promotional data." IODA, the Independent Online Distribution Alliance, is one of the industry-leading digital distribution companies for the global independent music and video community. IODA provides comprehensive services to record labels, physical distributors, artists, and filmmakers, including license negotiations; media encoding and metadata management; royalty payment administration and reporting; and marketing and promotional support. Founded in 2003 in San Francisco, IODA now has operations in New York, London, Tokyo, Barcelona and Stockholm. The company represents a rapidly expanding roster of more than two million music tracks and thousands of independent film and video titles. IODA distributes its music and video catalog to hundreds of digital storefronts worldwide, including all major digital music services like iTunes®, Amazon MP3 and Spotify and mobile carriers and outlets such as AT&T, Nokia and Verizon Wireless. The company's website is www.iodalliance.com.